"Talk not of wasted affection; affection never was wasted." "We mustn't take the poetry out of our affair." If you were to ask most people what they think an art house film looks like, then this would probably be their answer: something in French, that's full of pretty young people who talk a lot and use complicated language. In seventeen words, they would have also managed to give a very basic assessment of one of the late Eric Rohmer's most enjoyable films, Les rendez-vous de Paris/Rendez-Vous in Paris. Neat though that description is, it misses entirely is the unique quality that makes a Rohmer film different to any other. It's an elusive thing, a special thing, and the closest I can come is using a word like 'touch,' akin to the famed moniker used for the work of Ernst Lubitsch or to be more fitting, it has a certain je ne sais quoi about it. Looking at and describing Rohmer's films is easy; the complexity comes in understanding and connecting with them, and for many people it's a difficult task. Rohmer's wordy, philosophical world is undoubtedly beautiful – and not just because of his eternally youthful casts, always educated and articulate, photographed against the backdrop of an equally picturesque Paris – but it also brings a sense of emotional dislocation, which can make his films feel like experiments rather than experiences; as if you're viewing his characters under a microscope, and a particularly high-powered one at that. Of course, for a great many people, that analytical nature is exactly why they enjoy his work so much. With great auteurs, they're often an acquired taste, and that's definitely true in the case of Rohmer. If his work appeals to you, you'll rarely be disappointed and invariably like what you see. If the reverse is true, then his oeuvre isn't likely to be attractive to you at all. However, you'd be hard pressed to find someone who can't appreciate his cinema from the perspective of skill. There's a reason why he outlasted and in some cases outlived his nouvelle vague contemporaries, continuing to work after the passing of François Truffaut, and when Claude Chabrol's creative fire had long burned out. For those who are feeling brave and want to finally take the leap into Rohmer's considerable body of work then Rendez-Vous might be a good starting point, since it's the most accessible of his films, but crucially, not at the expense of the hallmarks he's become renowned for. His mixed fortunes over the years meant he took to making films in groups, such as the Contes moraux/Six Moral Tales (1963-1972) or Contes des quatre saisons/Tales of the Four Seasons (1990-1998). Ever astute, Rohmer realised that distributors were more like to give support to "a scenario which is part of a group rather than an isolated script," and it's a theory he follows to the letter with Rendez-Vous. Always ahead of his time, and yet curiously timeless – though he aged, his characters and subjects never really did – his films manage the often difficult task of remaining relevant. Intruingingly, the director's choices prefigure the current trend of ensemble/anthology romance tales such as Paris, je t'aime/Paris I Love You (a sentiment Rohmer would no doubt agree with an is everpresent in his work) it's later New York counterpart, Valentine's Day and Love Actually by some years. Like Curtis' film, Rendez-Vous is all the smarter by being borne from the creative talents of one man. Though a strange comparison, since these two men couldn't be more culturally or aesthetically opposed, it's an easy in if your exposure to foreign-language cinema is limited. A risk Rohmer's work might seem, but in my opinion it's a risk worth taking. Made outside of Tales of the Four Seasons, Rendez-Vous is not one film, it's three, exploring three different twentysomething couples living and loving in Paris. Outwardly, they aren't obviously connected, and could be watched in isolation – though there are bridging segments between each 'episode' with two street performers singing, much like the master of ceremonies in Ophüls' La ronde/The Roundabout – but they do have common threads related to passion, fidelity and seduction, as well as classic Rohmer twist (none of which will be revealed here, the cost to your enjoyment would be too great). The first story, 'Rendez-Vous at 7 O'Clock', tells the story of lovers Esther (Clara Bellar) and Horace (Antoine Basler). Both students, they're busy with their workload, so they make a special day with each other when their workload lightens. When Esther goes across town to meet up with her friend Hermione (Cécile Parès) to study, she confesses she suspects Horace is being unfaithful, and Hermione suggests she play him at his own game. On her away home, she crosses paths with a handsome stranger (Mathias Mégard) who she chats with as she browses through Montparnasse market. She ultimately agrees to meet him later that day at a local café. There is more here of course, but all I will say is things culminate in a rather lovely twist, which sets up the continued presence of coincidences within the film as a whole. Sometimes they're a little a little too neat, but it's a minor gripe and the execution makes up for it, especially in the dialogue, which is perhaps the greatest pleasure of a Rohmer film. The words, as ever, as wise ones; if only the characters would heed some of them. 'The Benches of Paris', the second instalment, is my personal favourite, and undoubtedly the most romantic. Two unnamed teachers referred to by their gender Lui (he) and Elle (she). The first teaches mathematics (Serge Renko) while his lover (Aurore Rauscher), teaches English. However, she's reluctant to end things with her unseen boyfriend Benoit, despite the fact she no longer loves him. The two meet in secret, hopping on and off the Metro, walking hand-in-hand through the gardens and parks of Paris, including the Parc de Villette and the Parc de Belleville, as they talk about their relationship and their future plans to move in together. When they decide to masquerade as tourists and spend the weekend together in a hotel, fate conspires against once more, and changes their plans. Though essentially a two-hander (and a beautifully acted one at that) Paris is the third character in this story, and it's clear that Rohmer loves this city too, it's never looked prettier, photographed simply by Diane Baratier – with more than a nod to Rohmer's nouvelle vague roots occurring through Rendez-Vous entire – it would work wonderfully as a Parisian travelogue in its own right. The third part of the film, 'Mother and Son' in 1907, is my least favourite of the three, purely because like most of the men in this Rendez-Vous as a whole, the self-centred artist (Michael Kraft) at the heart of this story isn't very likeable, so it makes his constant chasing of a woman he meets in passing on the street (Bénédicte Loyen) at the expense of spending time with a visiting Swedish acquaintance (Veronika Johansson) hard to relate to, much less enjoy. You actually want him to fail in his endeavours, just so he learns a lesson. The saving grace of this segment, for me at least was the genuinely intriguing discussion the artist and the girl (her husband publishes art books, and she oversees the illustrations) relating to the nature of art and how he perceives the world. I did wonder if there was a little of the youthful Rohmer in the painter, and I wouldn't be surprised if that turned out to be true. The one thing that is nice about that rather callous womanizer? His paintings. Looking at those through the secondary eye of the camera is rather lovely. Some would argue that Rohmer purposefully creates characters that are unlikeable simply to be contrary – which could be true – or just to reflect diversity within society. However, I think it goes deeper than that. The truthfulness these characters exhibit is sometimes brutal, but their mode of expression isn't simply a character flaw, it speaks volumes about where they come from and who they are. Different nationalities have different social mores and countenances, and it's near impossible to imagine any of Rendez-Vous being set anywhere other than Paris, spoken in any other language than French. It's so French in fact, the Gallic nature seems engrained in the negative, and makes the image spring out just that little bit more. Maybe that's the elusive quality that makes Rohmer so special? Few directors have the ability to depict true sense of French national identity on a personal scale to such great effect and in such uncompromising style. Framed 1.37:1, the image has the look of a good 16mm stock, though was more likely shot on 35mm. 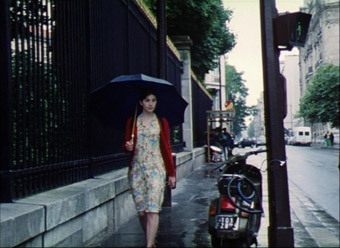 The pastelle colour scheme has a very filmic feel and are attractively reproduced, the bluish hue of some of the night shots a commonly employed atmospheric tint. Black levels are strong throughout and the contrast solid, though a touch aggressive in places. The Dolby stereo 2.0 soundtrack does well by the dialogue and captures the surround city sounds nicely. The range is slightly narrower than you might expect of a film only fifteen years old, but there's no damage, distortion or trace of background fluff. Disappointingly, there are none to speak of. Rendez-Vous in Paris won't be for everyone, and though it's Eric Rohmer at his most accessible, it's unlikely to win him any new fans. However, for those that do admire his work, this is incredibly enjoyable. Typically Rohmer in its beauty, elegance and wit, it's one of his best works. If you're already one of the Rohmer faithful, it's an essential purchase. If not, give it a try, see what you make of it, and expand your French cinema collection. It could surprise you.